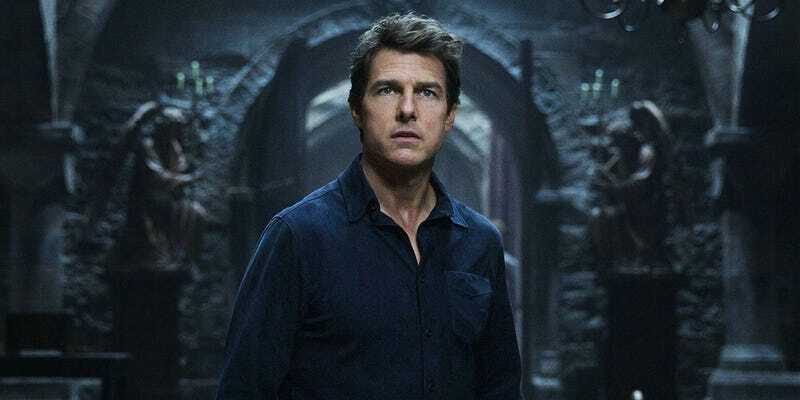 Tom Cruise’s new film, The Mummy, is essentially a monster movie Iron Man; it’s the first film in Universal’s new cinematic universe of monsters, which will include Frankenstein, the Invisible Man, and other horrors from the studio’s rich, historic past. Here’s the breakdown of everything The Mummy can tell us about the Dark Universe to come. You’ve got to admire the balls of The Mummy. Before the movie starts, after the standard Universal logo, the above Dark Universe logo plays, announcing straight-up to the audience that this movie is the beginning of a shared universe of films. That is, if you understand what “Dark Universe” entails, which surely a great many people just looking to check out the new Tom Cruise flick, did not. As the film begins, we meet Henry Jekyll (Russell Crowe) in a mysterious tomb below London. While down there, in voiceover, he explains that he’s uncovered many mysteries in the past but this may be his greatest one yet. What’s down there? As for those other mysteries he’s talking about, they could presumably be subjects in the other films. 3) What in the dark universe is Prodigium? Jekyll leads a group called Prodigium, which we slowly realize is like the Universal Monsters version of S.H.I.E.L.D. They’re a secret organization whose job is to study evil; specifically, they are supposed to “record, contain, examine and destroy” monsters. As explained by the film’s director, Alex Kurtzman, Prodigium is going to be a major linking factor in any and all Dark Universe films. The coolest Easter eggs in The Mummy come when Tom Cruise’s character, Nick Morton, first visits Prodigium. Walking into the office we see what looks like the forearm and hand of the Creature from the Black Lagoon, a vampire skull, and other things that flicked by too quickly for me to notice on one viewing. Either way, it’s a clear sign that those characters (the Creature and maybe Dracula) have have already been discovered in this world—and maybe dealt with. There another Easter egg that’s not tied into the future of this franchise but to its past. As noticed by Inverse, at one point in the movie, Jenny (Annabelle Wallis) knocks out a Prodigium employee with a golden book with a star-shaped keyhole. That book is the Book of Life from the 1999 Mummy starring Brendan Fraser. You don’t cast Russell Crowe as Dr. Jekyll and then fail to have him Hyde out. We see Jekyll’s transformation twice: The first time he manages to contain it with some kind of medicine; later he fully transforms and has a fight with Nick. Hyde feeds on chaos and suffering, so even though Jekyll has medicine that can contain him, it’s a fair bet that if more movies happen, we’ll get to see the monstrous Mr. Hyde fully unleashed. That medicine will probably end up being important, too. The big surprise in the film is that, at the end, the only way to defeat the Mummy, Princess Ahmanet (Sofia Boutella), is to go along with her plan. So Nick stabs himself with the magic dagger, in theory letting the evil God Set take over his human body. The new monster then kills Ahmanet, winning the day. However, we’re told that Nick is so good inside, he’s able to control the evil. After resurrecting his close friend Vail (Jake Johnson), he leaves for an adventure. In a voiceover, Jekyll and Jenny discuss Nick’s new form, explaining that he’s an undefinable mix of monster and man, dark and light, and that when the time comes, they may need a monster to help defeat other monsters. That’s pretty obviously a set-up that Cruise will come back as his new monster self. However, there’s no real clarification of who he actually is. Is he a new Mummy? Is he just Set? We don’t know. We just know that he’s probably not leaving the Dark Universe anytime soon. The stars of the Dark Universe: Crowe, Javier Bardem, Cruise, Johnny Depp, Boutella. Watching the film with an eye towards Dark Universe teases, there was one other thing I noticed—it may mean nothing, but it made me wonder, so I’m mentioning it here. At the plane crash site, the inspectors are picking up body parts before being killed by Ahmanet. One of the severed heads looked, to me, a lot like Javier Bardem. Bardem has been cast as Frankenstein’s monster, so having his disembodied head show up here wouldn’t be the worst way to introduce his character. The Mummy is now in theaters. The next Dark Universe movie scheduled for release is Bill Condon’s Bride of Frankenstein, set for release February 14, 2019.